A relatively new subspecialty of Optometry, geriatric eye care services are provided as an important part of one’s overall health management. With aging comes an increased need for comprehensive eye exams and for high-level, advanced treatment of many common ocular diseases. In addition, more and more of the global elderly population is enjoying their golden years with an active and healthy lifestyle. Nowadays, there is an unprecedented quality of life for seniors that makes quality geriatric eye care even more important than ever. Physical conditions such as hypertension, diabetes and cardiovascular disease, which rise in frequency as people age, are strongly associated with eye health problems. A total geriatric eye exam will inspect for the signs or effects of these risk factors. Cataracts are perhaps the most prevalent ocular disease in the elderly, and another significant feature of geriatric eye care is quality preoperative and postoperative management for cataract surgery. 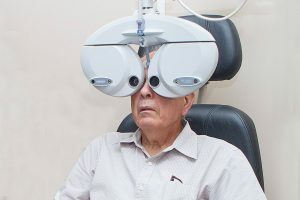 The specialized attention given by dedicated geriatric optometrists has been linked with more successful outcomes from surgical procedures to remove cataracts. Fortunately, many visual conditions in seniors are treatable, and optometric experts are now being specially trained to evaluate geriatric eyesight. 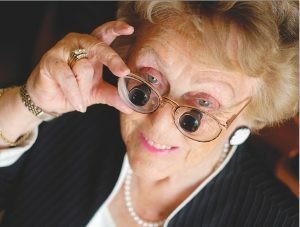 An assessment of visual acuity is a vital part of complete eye examinations for seniors. Statistics report that as many as 94% of patients in nursing homes require eyeglasses for myopia or presbyopia, yet sadly only 31% may be wearing appropriate eyewear vision correction! Untreated visual impairment can put the elderly at risk for many negative consequences, such as eyestrain, blurred eyesight and increased incidences of falls due to decreased coordination and lost balance. These falls are particularly hazardous, as they lead to a higher risk of injury and dependence, which severely impacts the quality of life for the aged. An up-to-date vision prescription and adequate eyeglasses are imperative for the long-term health of the whole body. If Low Vision is diagnosed, qualified eye specialists can provide advice and assistance regarding specialized devices and aids to maximize any remaining vision. Low vision can have a negative impact on the ability to perform routine tasks, such as driving, cooking or reading. This lack of mobility and total dependence on friends and family often leads to debilitating depression. Optometrists who specialize in geriatric care understand the need to help older adults maintain as much independence as possible. Proper eye care services can prevent this whole deterioration. One-on-one consultations allow eye doctors to respectfully determine the best low vision treatments for a senior citizen’s individual lifestyle and visual requirements. When seniors are homebound, these consultations are offered as in-home visits – making geriatric eye care as easy and convenient as possible. Routine geriatric eye examinations are the best preventive medicine, however, there may be significant symptoms that appear in between eye doctor exams, and these should not be ignored!